Following the 1993 Government White Paper "Realising our Potential"
by the large presence of MAFF on the Research Council . . .
within the [AFRC] was transferred to MAFF...."
at their CSL-Sand Hutton laboratory and at HRI/WHRI. In 2009 Defra spent UKP 16,954,649 on projects at Sand Hutton and at WHRI. "and to protect the global community from biological and chemical risks. while he continued as head of the horticulture department. most recently the five-star rating for research quality in 1996. Obituary Oscar Victor Sayer ("Peter") Heath, plant scientist: born London 26 July 1903; died London 16 June 1997.
on the East Malling site in 1913 on the impetus of local fruit growers. In fact, the original building is still in use today as part of the East Malling Enterprise Centre. afterwards becoming known as the East Malling Research Station (EMRS) for the next 65 years. EMRS became the AFRC Institute of Horticultural Research, East Malling. at East Malling, Littlehampton, Wellesbourne and the Hop Research Department at Wye College. at Efford, Kirton and Stockbridge House. 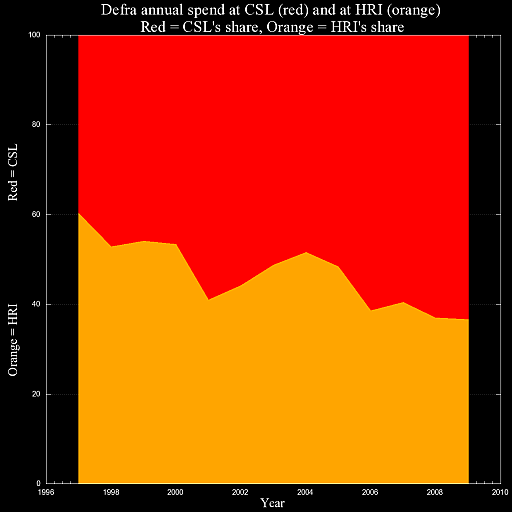 HRI was sponsored by Defra as a Non-Departmental Public Body (NDPB). a national resource centre for research and development of organic horticultural crop production. and interactive multi-media displays available on site and over the internet." 2010 "The European Centre for Organic Fruit and Nursery Stock"
is no longer functioning. It is now a Conference facility. when East Malling Research became an independent company again. of keeping the national fruit collection at Brogdale in Faversham. hides one of Kent's best-kept agricultural secrets. boasting a long and internationally-renowned history in experimental work on fruit trees. become the UK's largest funder of soft and top fruit research in the country. including the multiples, this position is unsustainable. of former science research units has been renovated into office/laboratory business facility for small companies. all at an extremely competitive rate." EMEC welcomes businesses of all shapes, sizes and sectors. Its dedicated on site management means that excellent relationships are built with tenants. in your business and remain open-minded and flexible in their negotiations and contracts with tenants. Indeed, EMEC believes that this is essential to appeal to companies in today?s climate. 1954: GCRI was established in 1954 at Littlehampton, West Sussex, with a research remit covering glasshouse crops, mushrooms, nursery stock and bulbs. It succeeded the Experimental and Research Station at Cheshunt in the Lea Valley (1914-1955), and also took over the work of the Mushroom Growers? Association Research Station at Yaxley, near Peterborough (1946-1954). Its first 14 scientific staff were re-located from these organisations and these were joined by a further 42 support staff, most of whom were recruited locally. The first development phase included a laboratory/office block, glasshouses (mainly wooden), a mushroom shed, boiler house, canteen, packing shed and maintenance unit, and these were formally opened in 1956 when the Agricultural Research Council (ARC) took over full control of funding, staffing and the research programme. Subsequent expansion was gradual, but sustained, and by the late 1970s the total staff complement exceeded 200, and the facilities for experimentation were among the best in the world. Extremely effective communications and a two-way flow of information between scientists and industry were ensured by basing the ADAS National Glasshouse Specialist and the Mushroom Specialist at GCRI, and by establishing a productive Liaison Department. In 1985, GCRI was merged with The National Vegetable Research Station at Wellesbourne in Warwickshire, East Malling Research Station in Kent and the Hop Department of Wye College to create the Institute of Horticultural Research (IHR). IHR was then merged in 1990 with three former Experimental Horticulture Stations, Efford, Kirton and Stockbridge House, to form Horticulture Research International (HRI). However, it was announced that a component of this re-organisation was to be the closure of the GCRI site and the re-location of staff to Wellesbourne. GCRI formally closed on 15 December, 1995.
bulbs, flowers and shrubs grown in the open. of new and interesting items of potential value to UK horticulture. and a biennial seminar on international future trends (Bewley Lecture). and the Secretary of State for Scotland in co-operation with the Agricultural Research Council. 1992: "It was clear by the late 80s that major changes were required in research structures and emphasis. to withdraw funding from near-market research deemed to benefit a particular sector. the termination of research specifically related to animal production and staff losses. and achieve economy by reducing the number of sites. Roger Wilkins "The Institute at North Wyke 1981-1999"
forms the Institute of Biological, Environmental and Rural Sciences (IBERS). in order to deliver its vision to be a sustainable, world class institution. "In its current form IBERS is expected to face a funding deficit reaching UKP 2.4m by the end of the 2011/12 Financial Year. "This is in the context of estimated reductions in public funding of at least 15% over 3 years. "In order to avoid such a situation, the Institute has identified the need to lose up to 70 existing full time equivalent posts. These will include technical, support, teaching, and research staff. "The proposals will be presented to the Council of the University on Friday 12 February. A 30 day consultation period with staff and Unions commences today the 5th of February. "It is hoped that the majority of job losses within IBERS will be achieved by means of redeployment within the University, voluntary redundancy and voluntary early retirement. "However, compulsory redundancies cannot be ruled out. related to lactation, breast cancer, obesity, diabetes, food quality and safety." and the gardens are part of the landscape. to grub the gardens by the time its lease expires later in 2007.
with local horticultural and agricultural industries in research and knowledge transfer. "We acknowledge the support of many local enterprises over this time. leading to the decision to close the site. fundamental strategic and applied research along with knowledge transfer. on the work at the Letcombe Laboratory. are proposing to amalgamate the Letcombe Laboratory with the Rothamsted Experimental Station. but it will eventually be necessary to relinquish the present site at Letcombe. the proposed closure of Letcombe research laboratory; and if he will make a statement. which receives grant-in-aid from the Department of Education and Science. and the need to direct resources to new work. a company that builds and runs retirement villages in the UK. having served agriculture and horticulture for exactly 100 years. providing some continuity with the programmes of work under way prior to closure. have agreed to merge to form a "super institute"
at the new Meat Research Institute (MRI) under construction at Langford near Bristol. Stephen James, the current Director of FRPERC, was one of the first staff to begin working at the Langford site in September 1967.
and formed the Food Refrigeration and Process Engineering Research Centre (FRPERC) in January 1991.
of animal health and wellbeing through research. The Institute is now a charitable company separate from but subsidiary to the Foundation. a bioscience centre developed by the Moredun Foundation. "This site enables the Institute to strengthen its links with industry and commerce. for its research in Agricultural, Food Processing and Environmental Engineering. due to changes in its own research priorities. Silsoe Research Institute thus ceased operations at the end of March 2006 after 80 years of operation. as many staff have either moved to universities or consultancies or have set up in business. to enable you to have continued access to this range of research experience and facilities. offered to staff employed at the National Institute for Research in Dairying at Shinfield, Reading, in my constituency. "The institute was closed last week. who has put down questions in another place, and by my hon. Friend the Member for Wokingham (Sir W. van Straubenzee). the Agricultural and Food Research Council (AFRC) Unit of Nitrogen Fixation. at the Royal Veterinary College and Queen Mary College, London. and occupied further extensions to the buildings in 1971 and 1976.
which included the John Innes Institute and Cambridge Laboratory. into a purpose-built laboratory on the John Innes Centre site. This move took place in late summer 1995. History of the John Innes Centre. severing its formal link with Cambridge University. 1955: It moved from the University Farm to Trumpington, on the outskirts of Cambridge. under the government's privatisation policy. and the Nitrogen Fixation Laboratory (Sussex). to newly built facilities at the John Innes Institute where they formed the 'Cambridge Laboratory'. 1985: "At PBI Jefferson found himself working alongside a great many scientists from developing countries ? and distributed lab packs to 500 research institutions around the world. organised research into the problems of horticultural production in Scotland. "It became legally established as a self-governing, grant-aided research organisation in 1953. See also "Plants, patients and the historian. (Re)membering in the age of genetic engineering"
More Units, More Institutes, More links needed!